Transformers is not just about giant robots shooting other giant robots. It's about giant robots shooting other giant robots with character. During a presentation of Transformers: Fall of Cybertron last week, High Moon Studios showed me a fast-paced action game filled with rich characters that never came across as robotic. I mean, who cares if the planet of pocket calculators with guns is falling apart? The draw of the Transformers, whether the viewer realizes it or not, is the exploration of human behavior through these shining robotic puppets. It's one of the reasons fans of the original series don't always take kindly to the more alien interpretation of the Autobots and Decepticons in the films. The reason those movies have so many human actors is so we'll have someone to relate to; in the original cartoons we just related to the robots. So a successful Transformers game has to capture that same spirit. 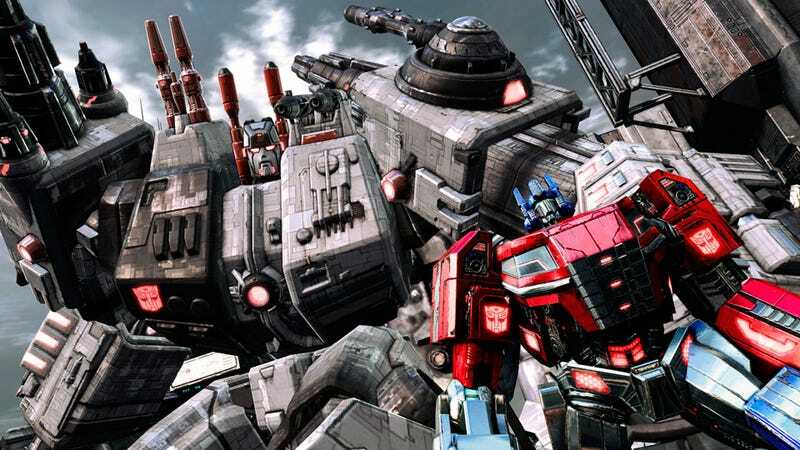 High Moon Studios did a fair job of this in War for Cybertron, sprinkling the action with entertaining dialog between friends and enemies alike. With its recently-announced top notch voice talent and a stronger sense of urgency, Fall of Cybertron is shaping up to deliver a deeper, more personal story about giant robots shooting other giant robots than ever before. It certainly helps that the original voice of Optimus Prime, Peter Cullen, is reprising his role once more in this game. Beast Wars' Gary Chalk (Optimus Primal) might have had more range, but nothing resonates with Transformers fans quite like Cullen's John Wayne-tinged tones. He is Optimus Prime. And for fans, Grimlock will always be Mr. Gregg Berger. Gregg has been voicing cartoons for ages, and his video game voice repertoire spans everything from Halo to Final Fantasy, but for countless robotic dinosaur aficionados he will also be the man that said "Me, Grimlock" several hundred thousand times. These two legends lend credibility to a cast made up of mostly big name fill-ins for beloved favorites. Nolan North, the man I believe is contractually obligated to be in every video game developed, lends his pipes to Bruticus, Cliffjumper (he's perfect) and Brawl. Fred Tatasciore, my favorite Hulk, is on Megatron duty, while also voicing Ratchet and the massive Metroplex. Steve Blum handles Shockwave, Swindle and Sharpshot, while Isaac Singleton goes monotone for Soundwave. My favorite performance, however, came from the amazing Troy Baker. After watching the Autobot Jazz bantering with his partner in anti-crime, Cliffjumper, I had to check with the High Moon rep to make sure the original Jazz, Scatman Crothers, hadn't be magically resurrected. Baker is amazing, and I'm sure his stint as Jetfire and the Insecticon Kickback are just as good. So character is not a problem for Transformers: Fall of Cybertron. Now all we need to do is convince Hasbro to give Bumblebee back his damn voice and we'll be ready to roll out this fall.